Yesterday we looked a the most-recent data on foreign residents in South Korea, breaking down their home countries and new locations. But how has this changed over time? Unfortunately, we don’t have longitudinal data on foreigners’ counties. But we can show the proportion of foreigners in Korea’s major geographic administrative units — its provinces and autonomous large cities. And with the added dimension of time, you can notice major changes in the last two decades. The capital city, Seoul, for example, now only has about a quarter of the country’s foreigners, according to data released by the Korean Statistical Information Service. That’s down from 52 percent in 1992. Many appear to be settling in Gyeonggi-do, the nation’s most-populous province (it surrounds Seoul). 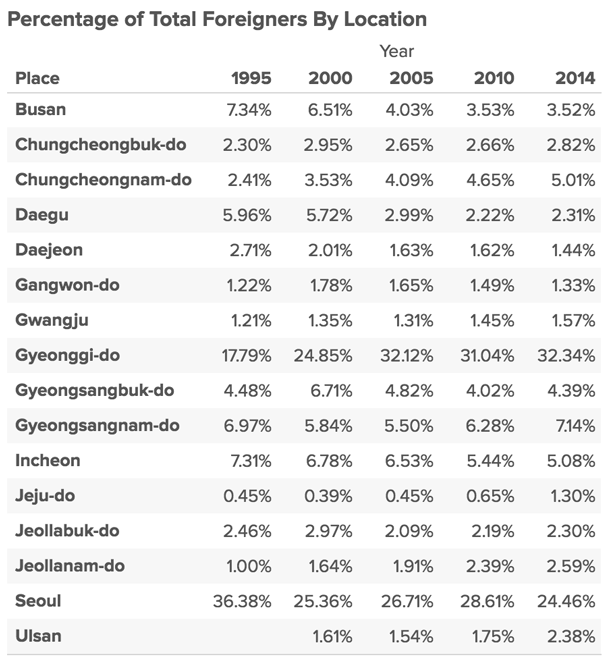 Adding gender shows some slight differences, especially that Seoul has about 30 percent of female foreigners, compared with 20 percent of their male counterparts. I enjoyed reading the articles you wrote about foreigners in Korea. I’ve subscribed so that I’m up for the new info on Korea. I’m doing research for marketing and sales purpose at KOLON, as we’re building a co-living space in Gangnam area. We are looking to have foreigners move in and your articles gave me some ideas where many of them are currently living at. ← Where are Korea’s Foreigners From?